NAGURU – Police have burnt drugs worth UGX7 billion that have been impounded in the last three years. At an event presided over by Deputy Inspector General of Police, Maj Gen Muzeyi Sabiiti on Thursday, 68 kg of heroin, 16.5kg of cocaine, 12.4kg of marijuana, 148.5kg of Catha-edulis and 4kg of methamphetamine totalling to 250kg were set alight. The narcotic drugs were burnt after Entebbe Chief Magistrate Mary Babirye on Tuesday ordered the Criminal Investigations Directorate (CID) to dispose of the drugs with immediate effect. Ms Babirye said she had realised several orders have been given to destroy the drugs but were not being implemented something that could tempt officers keeping guard of the impounded drugs to tamper with them. “Drug smuggling is criminal in nature and once a ruling has been given and suspects convicted, drug exhibits should be disposed of within 14 days unless someone has appealed,” Ms Babirye said. Other drugs burnt yesterday included 120kg confiscated between 2015, 2016 and 2017. These included 79.5kg of cocaine, 22kg of heroin, 17kg of marijuana, mixed cocaine and heroin worth 1.4kg. 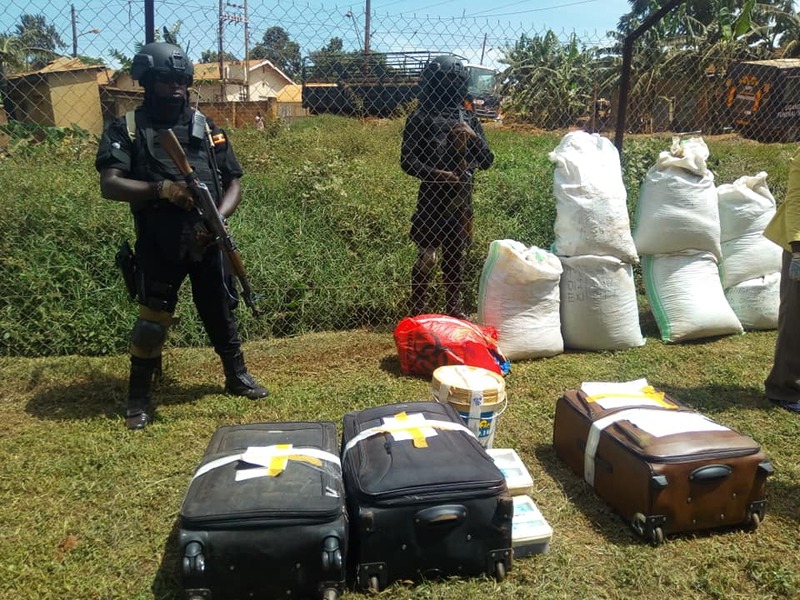 CID director, AIGP Grace Akullo, said 83 suspects were apprehended over drug smuggling in a three-year period among them 31 Ugandans, six Tanzanians, three Italians, three Rwandans, two Brazilians, two Romanians, two Norwegians and two Dutch. Ms Akullo urged detectives to maintain integrity and professionalism while conducting anti-drugs operations and handling smugglers. She applauded police’s canine unit which she said has been vital in detecting concealed drugs. “Fighting drug smuggling calls for cooperation between us and other countries. As Uganda police we are ready and committed to ensuring drugs are reduced in this country,” Ms Akullo said. Previously police burnt three batches of narcotic drugs. The first one was conducted in July 2008 where 1052 heron pellets were burnt. The second batch was burnt on August 9, 2011, where 25.5kg of heroin, 10.9kg of cocaine and 1.5kg of methamphetamine were destroyed. On June 27, 2014 police burnt 85.9kg of cocaine, 41,7kg of methamphetamine, 16.4kg of ephedrine, 8.5kg of cannabis and one kg of mixed cocaine and heroin totalling to 153.7kg. Commissioner for Antinarcotics unit, Tinka Zarugaba, said drugs are sold on black market whereby a kilogram of cocaine costs at least $15000 (Shs54m) while heroin goes for $10000 (Shs37m). “Drugs involve a lot of money this is why several people are tempted to engage in this kind of trade despite knowing it is a risky venture,” Mr Zarugaba said. Maj Gen Sabiiti castigated those that have been branding Uganda police force as a corrupt institution saying if they were indeed corrupt they would not have kept the drugs for all that time since they are tempting. “Drugs are deadly to our society and their impact is diverse. When you look at HIV prevalence among drug abusers it at 17 percent while national prevalence percent are around 6.8percent. We need to fight drugs,” Maj Gen Sabiiti said.